The fourth chapter in the Purge franchise is now available to own on 4K Ultra, Blu-Ray, DVD and on Demand. The origin story explains how the world began purging on an annual basis, “releasing the beast” in a psychological experiment designed to encourage aggression on one day and keep the peace the rest of the year. As we know from three previous Purge films, on purge night all crime, including murder is legal. When the sirens blare, citizens have twelve hours to release their inner demons on anyone they choose. They can settle an old grudge. We have seen jealous neighbors purge. Some people go after the ones who hurt their family members. Some people are just crazy. Others are evil. Many people just want to make it through the night alive, unharmed. For the very first purge, the residents of Staten Island are the test subjects. If they agree to stay home and be present for the event they will receive $5,000. Those who choose to participate beyond that will receive additional compensation. The citizens are implanted with tracking devices and are asked to wear glowing contact lenses that will records their activities. 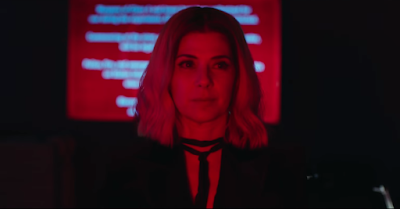 Dr. Updale (Marisa Tomei) is the sociologist who conceived of the experiment. She does not work for the New Founding Fathers of America (NFFA), the group that seems to now be in charge of the country. 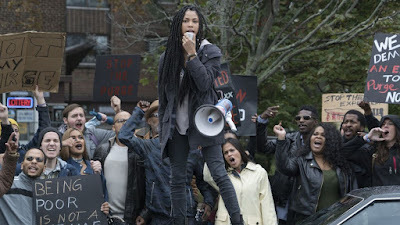 The NFFA claims to have nothing but the needs of the community at heart, but local activist Nya (Lex Scott Davis) protests and encourages her fellow citizens not to participate. She is not alone in her belief that the NFFA is trying to weed out the lower class, like herself and her brother Isaiah (Joivan Wade), who she supports. The projects they live in will become the test case. The NFFA and the nation are watching to see if enough regular citizens participate in the experimental Purge. Local gangbanger Dmitri (Y’Lan Noel) explains that they are good people. They will get crazy and rob and loot but there won’t be much killing because that takes an evil heart. Will the NFFA step in to stack the deck as the nation watches the experiment play out? 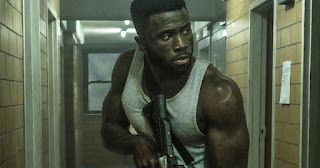 I believe that if you like one Purge movie you like them all. They are all pretty much the same idea and I happen to like it. It’s certainly not for everyone. First of all, violence better not bother you. Although, I saw this in the theater and was sad for humanity when a couple brought a three-year-old into the theater. These films are not for children and just because they don’t understand what’s going on doesn’t mean it’s okay for kids to watch this kind of thing. That’s how you make future serial killer people! The films do make you think about what life would be like if the purge was a real thing. Would your boss be nicer to you? Would people cut each other off less in traffic? Would there be any homeless people or would they all disappear on the first purge night? It’s one thing to hate people but who would really take people out. More importantly, who would take you out? Maybe it’s someone closer to you than you think. This film could also give you a lot to think about. The psychological ramifications of living in a society like this are endless. It also works as a thriller/horror flick. The film is well cast with solid performances from primary and supporting roles. The film is Directed by Gerard McMurray, who also directed Burning Sands. The First Purge 4K Ultra is presented in a widescreen 2.39:1 ratio. The purging happens at night, which is where you’re glad you have a 4K disc. Inside an abandoned building, in the darkest conditions, you don’t strain to make out characters or their surroundings. The blue and red contact lenses pop with a brighter color than you’ll see in the Blu-ray, which still looks very good. When Isaiah stumbles into an alley of teddy bears, the textures and detail are more apparent in UHD. Purging involves lots of gunfire and the DTS: X Master Audio presentation holds up well. The different types of weapons ring true. Explosions will rock your living room if you let them and crank up the volume. Dialogue is spoken, yelled and whispered but doesn’t require you to adjust volume. It is intelligible throughout the film. Music is well place and prioritized. With drone and rockets this is a full and immersive audio experience. Deleted Scene (1:48) – A scene where ‘Skeletor’ gets his. A Radical Experiment (4:57) – Cast and filmmakers discuss the purge experiment and its relevance and ramifications in society. Bringing the Chaos (1:25) – A look at the increased action and intensity in this installment of the purge franchise with bigger battles and a larger scope. 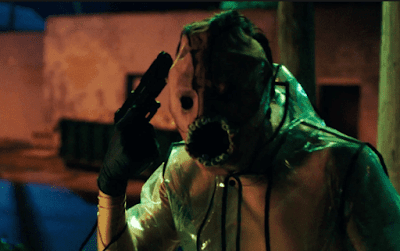 The Masks of the First Purge (1:23) – A very brief featurette focused on some of the masks that bring new kinds of terror to the film, the creepiest being the teeth mask. The First Purge was a question I thought needed to be answered: How did everyone agree to start killing each other once a year? As with every semi-successful movie, they will probably keep making far too many of these films. Four might be too many already. I like these films a lot, but we don’t need to see Purging at nursing homes, purging at day care. I feel like the point has been made that people are messed up and do messed up things to each other. If you are at all interested in the other films, you should take the time to see this one and see how and why it all started. The 4K UHD has good technical merits but is light on the extras. Overall, still a good release. For such a dark film (lighting and mood) a UHD purchase is not a bad choice. Recommended.